The multi-screen revolution is being driven by the consumer and is developing quickly. It offers huge potential and a bright future for operators adopting OTT across multiple devices. By delivering quality television services operators are expanding their market potential and thereby significantly increasing revenue and meeting the ever increasing demands of their customer base. But consumers dont just want to view content anytime, anywhere, they want to be fed that content based on what their friends are watching and they want to fi nd it quickly and easily. To answer the needs of this ever growing market nangu.TVs app available for download via the App Store or Google Play provides users of its platform with a whole host of features for multi-device and remote control use. A key addition to the nangu.TV app is its Recommendation Engine. There are three input elements: the metadata or information about the content; the user behaviour; and the priorities of the operators. Points one and three are clearly defi ned, whereas point two, the user behaviour, is gathered from several different places. To enable point two, the Recommendation Engine tracks the selections made by the user including: VoD channels; archived material; played content; Time Shift viewed content; ratings; or content from a bookmark. Between the input and the recommendation, the processing engine works on the basis of four types of algorithms: association rules; user behaviour; frequently occurring series; and predictions based on genre, cast, etc. All these algorithms work together to deliver the output. Its important to set the weight of each algorithm to yield the most accurate results for the given priorities that the operator establishes. In one way a Recommendation Engine is similar to a universal framework that can be applied to any data. Once data is input, the Recommendation Engine makes a complex system of associations between the individual elements. When an action, such as pressing play or bookmarking is carried out, the Recommendation Engine immediately highlights this as the focal point and reveals the content that is in any way connected to it. Additional clicks, such as clicking further detail, will strengthen connections and generate new content. Recommendations can show similar movies, genres, date of production or other user preferences. The Recommendation Engine can even go as far as to make recommendations on similarity of scenes. Fingerprinting allows for predictions to be made based on the visual effects; a feature that users may not even identify as a criteria that affects their liking of a movie or series. TV continues to be a source of entertainment and comfort. Operators can provide this security with the Recommendation Engine while increasing ARPU, a small investment that leads to a larger margin. The more comfortable the user feels that they can easily access relevant content the more likely they are to remain loyal to the service. Using the nangu.TV app its also possible for consumers to control their TV using a tablet or Smartphone device. This remote application enables simple browse capability with on/off, play, pause, start again and volume adjustment. Pop-up push notifi cations on the second screen alert the user that content is starting and a single click plays it on the TV. The search optimisation is highly advanced enabling fi ltering based on chosen criteria. 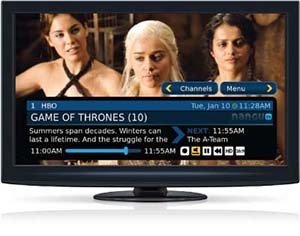 Users can search, record, bookmark or play content on the TV freeing up the second device. With the integration of apps on mobile, tablet and smart TVs, watching OTT content across multi-screen devices has never been easier. 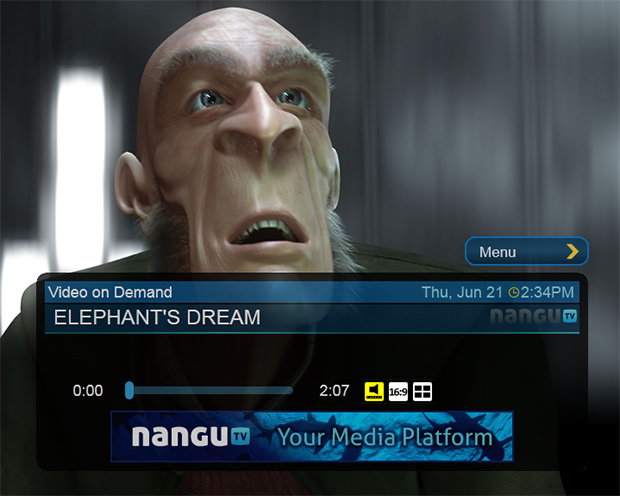 Users of the nangu.TV platform simply purchase the app and access content on the platform using the pin number provided by their operator.